I get a few health-related publications, but none are as well researched and radical as the Nutrition Action Newsletter, a publication of the Center for Science in the Public Interest. CSPI is quite political, and while I don’t always like the biased and sometimes snarky tone of their articles, they are tops in the field and fight the good fight for the underdog: legislation for and access to good, solid nutrition. CSPI attacks junk food ads (particularly those that target children), fights to improve school lunch programs, and exposes restaurants and food companies for their exaggerated health claims: “May lower cholesterol!” “May boost immunity!” “A good source of whole grains!” What? Count Chocula? I doubt it. CSPI also lobbies for better food labeling and food safety. Nothing food related is off their radar. In the December issue, they had an extensive article on movie theater popcorn and compared the nutritional information for all sizes of popcorn at three national theater chains. It’s scary what passes for a “healthy” snack. I’m pretty wimpy when it comes to controversy or creating controversy, so in the field of my nutritional interests, I let CSPI do it for me (and writers like Michael Pollan and films like “Food, Inc.” and “Supersize Me.” I prefer to work behind the scenes. 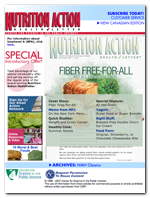 And part of working behind the scenes is giving one of you a one-year subscription to Nutrition Action Newsletter. (Disclaimer: This is paid for by me with no recognition or benefit from CSPI.) Because I’ve gained so much insight from this publication AND from you, my readers, I thought as a holiday gift, I’d unite one with the other. I wish I could give all of you a subscription, but alas, I work for peanuts and can only afford one. For your name to be in the pool of potential winners (one name will be drawn randomly), all you have to do is answer one question: What positive nutritional changes or adjustments did you make this year and/or what are you resolving to change nutritionally in 2010 to be a more healthy consumer? Leave a comment here or send me an email at lynnbering@verizon.net. I will announce a winner on Thursday! This entry was posted in Uncategorized on December 21, 2009 by Lynn Haraldson. This year I stopped eating frozen meals such as Lean Cuisines. I realized they have too much sodium and too many processed ingredients so I cut them out of my diet. In the new year, I would like to increase the amount of protein I eat in my diet because I do not think that I eat enough protein currently. We have really tried to eat locally this year as much as possible. I don't know as that is necessarily nutritionally different, but eco friendly. Thank you for this giveaway and thank you for being such an inspiration to me! Other than Low-Fat Wheat Thins, I Can't Believe It's Not Butter-lite, and tinned/canned whole almonds, I have stopped eating almost all processed foods. My produce eating has increased substantially. Along the way, I have lost 66 pounds in 2009.
for 2010, more of the same, esp. as I move into maintenance probably the 2nd half or so of February. And I plan to use my success to help spur others on; i.e., pay it forward. This year I added free weights to my workouts! Indeed, my under-arm jiggle zone is firming up nicely. This year I have eaten a variety of vegetables every single day. I have learned to love, and crave, healthy foods I never before would have even eaten. I also don't eat red meat anymore. This year I have really made the switch to single ingredient foods, which means that I buy very little processed food anymore. Plus I've added “good fats” into my diet – I no longer shun nuts or avocados. Interesting newsletter – I've never heard of it, but I do like that the CSPI calls companies out on their bogus health claims. Thanks for doing this! Don´t include me in your generous raffle, because I don´t live in the US, but here are a few of my changes for what they´re worth. I switched from coffee to genmaicha (green tea with roasted brown rice). As I really can´t drink coffee without milk and sugar (and I hate the taste of artificial sweeteners) this has really taken away a source of calories and sugar in my diet, as well as lowered my caffeine intake. I make a big pot of vegetable soup every week to my own recipe which involves a long simmering time and no added fat. I eat a big bowl of it about an hour before dinner to spread out my supper which helps me to stave off the pre-dinner munchies. Since I don´t count the calories in most vegetables, it´s a zero calorie snack too! I´ve given up alchohol and managed to replace my nightly glass of wine with herbal tea instead (iced right now, because of the current heatwave). This year I started eating a bowl of oatmeal with cinnamon for breakfast. Helps with the morning hunger which has helped me cut snack calories. I have eliminated HFCS from my diet even to making my own ketchup and jams. Next year I vow to do more portion measuring to reduce my meal sizes. and I would LOVE the subscription, it sounds wonderful. This is a great newsletter, and my subscription has run out, so I would love it! I have made a lot of positive changes in my diet this year. One of the first and most noticeable is that I quit Cool Whip Lite cold turkey! And along with that was my trend towards NO processed food. Not there completely, but pretty close. Thank you, Lynn, for your continued inspiration! This year I have given diet coke! My favorite but it has now been 8 months since I have had one and have not plans to go back to them. I have added weights to my workout too. My plan for the new year is to give up beef. I too ate a lot more veggies this year and tried new ones. In the coming year I would like to eat even more veggies and a few less carbs. Smartest thing I did all year…..
Have a great holiday, Lynn. I LOVED reading all the comments that you got on this one. I think you should make this an annual post (not asking you to spend $$$ every year, but asking what changed). This year, for me, was dropping chicken and turkey (the year before was beef and pork, I guess I do these things in twos). And while I think that no meat is healthier, I think a bigger benefit was that it made me step UP the diversity of my food. I have been trying new whole foods because of this change. This year I stopped dieting. I changed the way I and my whole family eats. My husband and I have lost weight and the kids moods have improved dramatically. Amazing! It's not too earthshaking, but I have been eating fresh fruit on a regular basis. I aim for, and usually eat, 2 pieces of fruits a day. Also, I have been eating new fruits – hello pomegranate seeds! Next year, I'd like to consistently eat 4 big servings of veggies a day with 2 being dark leafy greens. Debby, Your comment had me imagining you smothering slices of leftover roast turkey with fat-free Cool Whip. OK, maybe the heat here is starting to affect my brain. Buying tomatoes in glass jars. I've also really enjoyed keeping up with your blog as I work on losing weight and keeping off what I have already lost. One change I've made this year is that I eat very little red meat. We use ground turkey meat in everything I used to use ground beef for. I'm not sure what I'll change for next year…. As I start my weight loss journey, I have lost 10 pounds since Thanksgiving – my nutritional change was to eat thoughtfully. I am studying and reading and researching to eat in a healthy way. I am just over the 60 year mark, and healthy eating involves more than just losing weight. I have lost weight on weight watchers, and I lost weight on Nutri Fast with Oprah. Now it's now just losing weight, it's taking care of myself. I've just found your blog and look forward to continuing to read it. Thanks for a great give away idea.